A stripped back Burning Rain made an appearance in Edinburgh. 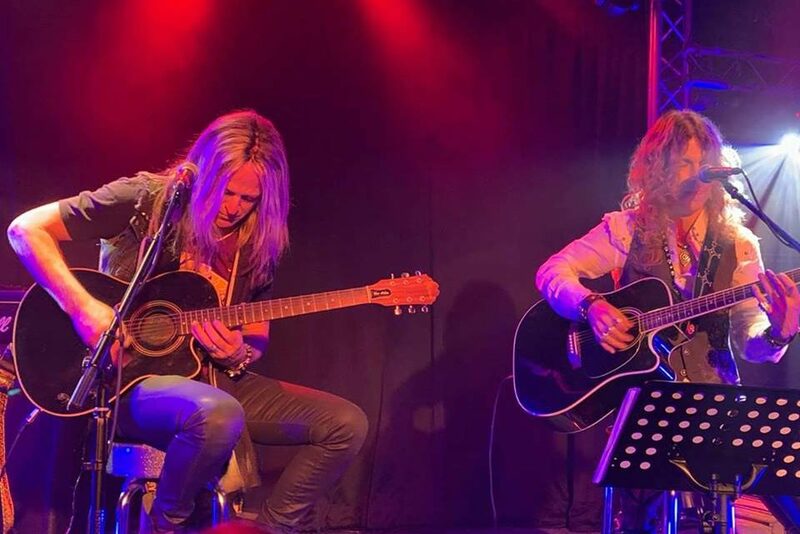 Main men Doug Aldrich (Dead Daisies, Dio, Whitesnake) and Keith St John (Montrose, Quiet Riot, Sweet) took to the stage armed with just acoustic guitars at 9pm. Kicking off with Jumpin’ Jack Flash before treating us with tracks from all 4 Burning Rain albums, this Edinburgh crowd made these 2 guys smile like the cats that had got the cream. The audience was lapping up tracks such Smooth Locomotion, Beautiful Road, If It’s Love and Heaven Gets By Me from the Burning Rain catalog, but when the band went off script it took the atmosphere in the place to a completely different level. Keith St John is a formidable vocalist. Proving that he can go from sultry soul to dirty rock and metal is not only effortless but an experience to hear. His vocal on All Along the Watchtower was sublime, as for his vocals on Purple Haze and You Can’t Always Get What You Want, showed that he certainly has a set of pipes. Doug and Keith did a fantastic job of keeping the audience engaged, which is no mean feat just with 2 guys with acoustic guitars. 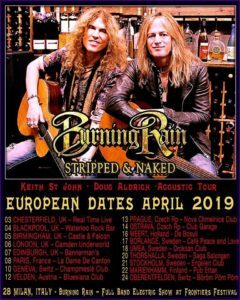 It was a night to remember and the hairs firmly stood on end for the entire performance and if you get a chance to see them on any of these acoustic dates. It’s a no brainer to get tickets. Roll on later in the year for the full band.